Yup. This bread is pretty genius. The other day, when I was feeling extremely lazy, I decided that I was going to just pull out all leftover veggies in my fridge and eat them for lunch. I wasn’t in a salad mood, so throwing everything into a bowl with lettuce was out, although probably delicious if I was feeling it. 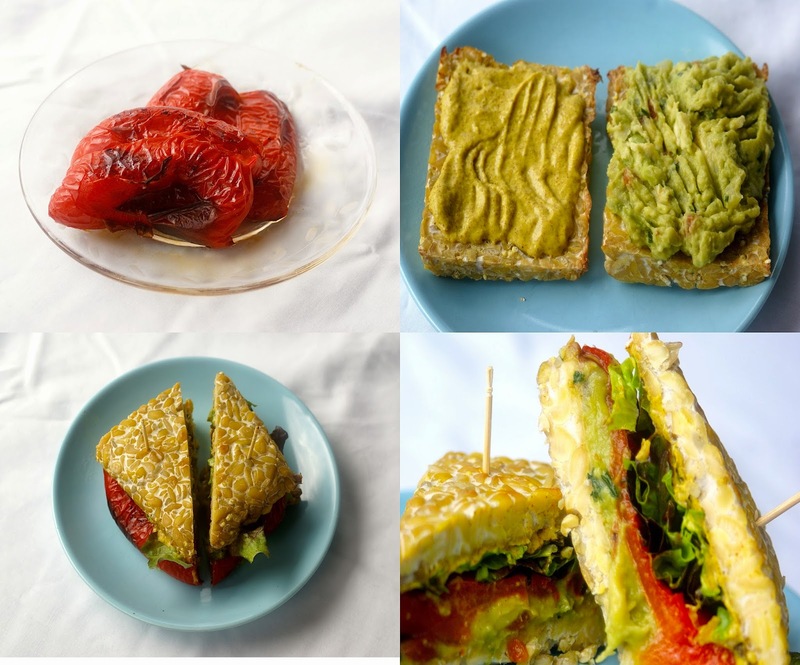 After considering just sticking a spoon in the leftover guacamole, dousing roasted red peppers in mustard, and going at it, I got the idea for this tempeh bread. Minimal effort is required and the result is actually a crispy and chewy “bread” like texture that is prefect for stuffing with anything your heart desires! Tempeh bread is gluten-free, yeast-free, high-protein, low-carbohydrate, vegan, mineral-rich, no-kneading-required bread that is very satisfying. 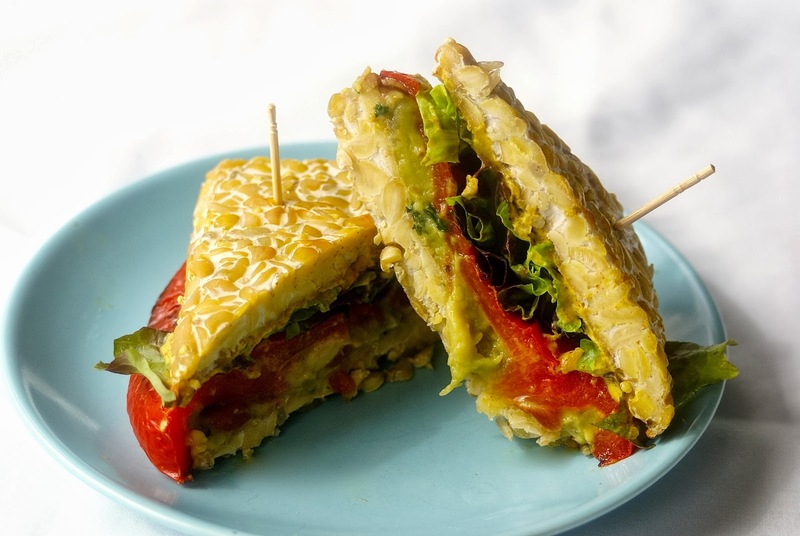 Who knew there were so many uses for tempeh?! 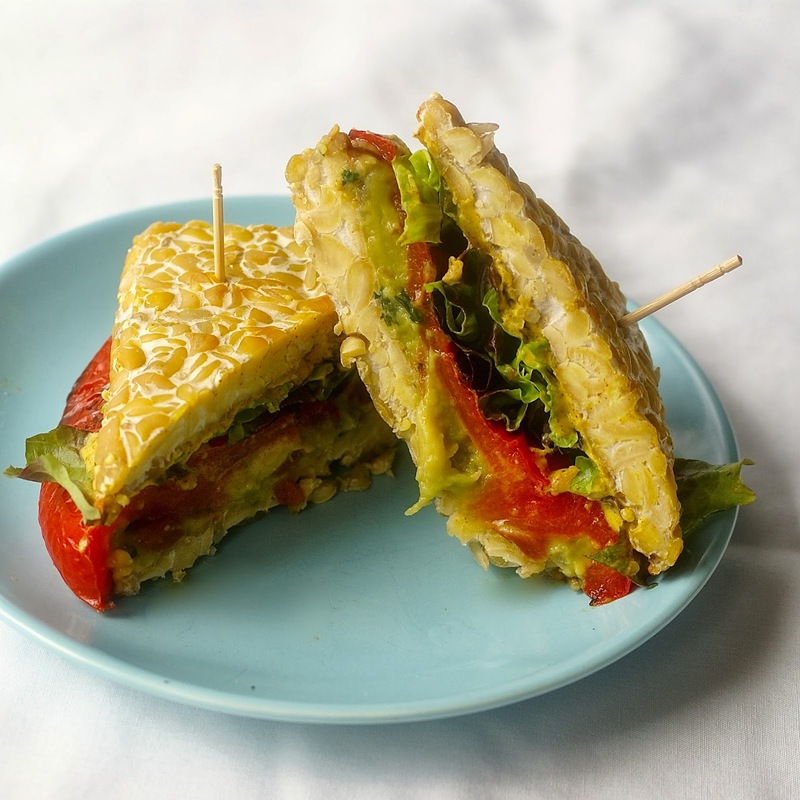 I think I’m going to have to try this tempeh bread with my recipe for tempeh avocado salad. It’s impossible to have too much of a good thing! Preheat oven to 375 F and line a pan with parchment paper. Cut tempeh in half, then slice each half so you are left with 4 large, flat pieces. Bake tempeh in preheated oven for 10 minutes. …alternatively, go in your fridge and pull out whatever spreads and vegetables you have leftover and slap them on tempeh bread! Spread guacamole on two of the tempeh bread slices and the spicy mustard on the other two. Arrange the rest of the veggies on one half, then place the other half on top. Looks very interesting. Since we just made fresh tempeh today, I will be giving this a try. We produced Betsy's Tempeh in Mich. for 9 1/2 years developing a new process for making tempeh. Since retiring we developed our website showing our easy method for making tempeh at home. Feel free to write us with any questions or comments. That's awesome! I have always been curious about how to make tempeh, or if it is possible to make at home. Love your site! I think it's brilliant that you share how to make tempeh so anyone can do it! I'm sure your tempeh tastes the best! It always surprises me how tempeh taste can vary by brand. Thanks for the comment and introducing me to your site! If I decide to make my own at some point (when I'm feeling brave lol) I will be sure to let you know how it goes! what a great idea. can’t wait to go to your site. thanks. Going up to whole foods tomorrow & hopefully they have. Recently diagnosed allergy to gluten which opens a host of what now ???? I love the idea of tempeh BUT I have avoided it since the ingredient list has barley which is not gluten free. Even at the makethebesttempeh.org they use barley in their preparation. Is it essential for tempeh? I have found versions that are made with only soybeans and rice, but I have never made it myself. I believe you can use buckwheat/millet/other naturally gluten-free grains as well, however again I’ve never tried.